This Just In: Zimmerman Had Drugs in His System Too? The Trayvon Martin case remains in the spotlight as new evidence about what happened on his last day of life continues to emerge . From the 7-11 surveillance video minutes before the encounter to medical records revealing that Martin had THC in his system the day of the killing, the media has plenty to cover. One surprising detail hasn't been populating the media-sphere that I think is very important. George Zimmerman's medical records revealed that he was under the influence of drugs at the time of the altercation; and I can't thank any of the major media outlets for informing me of this new-found revelation. If I had never got an email alert via Your Black World through their newsletter, I probably wouldn't have never known this. I decided to do a little web searching to see who else wrote about the claim. I entered the phrase "Zimmerman had drugs in his system." Very specific and to the point right? What did I get back? Pages upon pages of Google results with some variation of the headline "Trayvon Martin Had Drugs in His System At Time of Death." Definitely not what I was looking for. So I went back to the article from Your Black World. Temazepam. That's the drug that was in Zimmerman's system the night of the shooting. So I searched "Zimmerman Temazepam." Headlines like "George Zimmerman Had 'Close Fracture of Nose' Was Taking Aderall & Temazepam" appeared. Very different from Martin's search. Now I do understand that THC (a chemical found in marijuana) is illegal. In the early stages of the case, Martin was portrayed as this innocent almost angelic high school student who could do no wrong. Meanwhile, George Zimmerman was made out to be a mad man. So it's natural for media outlets to want to unveil that Martin's record wasn't squeaky clean. Let's hope it was to paint a more accurate picture of the teen. Temazepam and Adderall are drugs that have dangerous side effects. According to the U.S. National Library of Medicine,Temazepam, which is taken for insomnia can cause anxiety, hallucination, fatigue, nervousness, dizziness, aggressiveness and hallucinations. Adderall, which is taken primarily for attention deficit hyperactivity disorder, can cause aggressiveness, delusions, hostility, anxiety and depression. So not only was Zimmerman armed with a gun, it's reasonable to assume that he was under the influence of such drugs. Whether or not Martin having a little bit of weed in his system is important in the grand scheme of things is another story. The drugs that were found in Zimmerman's system are usually obtained via prescription from a physician. Is that why it wasn't on the front page of major media outlet's site or paper? Or did these entities feel that they had enough information to focus on regarding the case already? I'd like to heir on the side of objectivity, but it's pretty hard not to raise an eyebrow or two at the fact that predominantly black publications were the first and only (with the exception of MSNBC's brief mention of his use of the drug) that wrote about this detail. I'm curious about quite a few things but I will leave you with two. 1. Why the heck does Trayvon Martin having THC in his system get blasted by the media without even a fraction of a mention of Zimmerman being influenced with drugs that cause anxiety, mood swings and hallucinations? and 2. how will this new-found information affect the outcome of this case? Being under the influence of prescription drugs should not be justification for killing someone. But given the way that things go here in America, the inherently flawed justice system just might lend itself and lean in Zimmerman's favor. Shantell, the answer is that we don't know whether George Zimmerman had Temazepam or Adderal in his system the night he shot Trayvon Martin. That's because the Sanford police accepted Zimmerman's claim of self defense and did not order toxicology report on Zimmerman (they did order toxicology on Martin). We know from evidence released last week that Zimmerman's doctor had prescribed both Temazepam and Adderall for him. But we don't know whether Zimmerman had taken those meds, or when. I noticed on the doctor's report the notation "IBS" -- that's irritable bowel syndrome. It's common to prescribe benzodiazepines for IBS because IBS is aggravated by emotional stress. The medical report that was made public didn't specify why that drug had been prescribed. As for your finds on the Internet, well, you can find anything at all on the Internet. Tain't necessarily so. I think George Zimmerman was a neurotic fool who acted out aggressively because he was frightened. I understand anxiety; it's debilitating. People who suffer from debilitating anxiety shouldn't carry firearms. I also read, in the evidence dump, a statement from a paramedic that said Zimmerman was on one of those drugs. I "assume" Zimmerman told the medic that he'd taken it. I would also assume there's some standard procedures for asking patients if they've taken meds taken during a certain period of time. 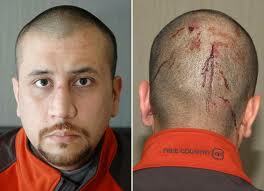 OAN: The wounds on Zimmerman's head do not say "my head was REPEATEDLY POUNDED into concrete". Repeated pounding would produce wounds very different from a couple lacerations high up on the head. I'm just saying. "Repeated pounding would produce wounds very different from a couple lacerations high up on the head." Do you have one shred of evidence to back up this statement? Shan Tell'em some more lies. Just because you assume something doesnt make it so. Why dont you get your facts straight before blasting the media for not reporting your theory as news. As if the mainstream media hasn't skewed the facts enough in this case you want more. The fact is that we have no idea what drugs were or were not in Zimmermans system, only what he was prescribed. I can not believe you have a degree in journalism. Guess they'll give those out to just about anyone these days. It's not news when a person is taking medications that are legally prescribed to them, that's why nobody is "reporting" it. It really makes no difference whether or not Trayvon had THC in his system that night either, but that's a difrerent story. He was more than prescribed the drugs, they were found in his system. Here's a very small exceprt of that fact as mentioned in this msnbc.com post: "Zimmerman himself was on a prescription for Tamazepam, according to the paramedic's incident report reproducing his medical records. (Tamazepam is also known as Restoril and is prescribed for anxiety and insomnia.) "
That's why I said: "...a person is TAKING medications..."
My point is, when a person has a prescription for a drug, it's not news when that person has that drug in their system. Hell, it would be news if he WASN'T taking his anxiety medicine. Shantell, please, you're embarrassing yourself. The msnbc.com post reports what we all agree it reports -- that Zimmerman had been prescribed Temazepam (not "Tamazepam") and Adderall. That information is in the released evidence. We're not debating that. That is not the same as saying those drugs were found "in his system." We have no idea whether those drugs were in his system at the time of the shooting. Zimmerman apparently reported to the EMTs that he had been prescribed the drugs. That is not the same as a toxicology report indicating that the drugs were "in his system." You seem to have missed the entire controversy over why the Sanford police ordered toxicology for the victim and not the shooter. It's a key issue in the accusation of police mishandling. If Zimmerman also had alcohol in his system, that could also have been important evidence. But we'll never know. Your article is misleading. What you should have said was that Zimmerman had been prescribed Temazepam and Adderall, not that he had those drugs in his system. Instead of defending your flawed position and citing as evidence an unrelated msnbc.com article, you should be retracting/clarifying your assertions. That means illegal drug user, does it not? Embarrass myself? Never. The fact remains that this was not reported nearly as much as Trayvon Martin's discovery. Back to my original question. Why? I'm sorry Shantell but your Google skills are seriously lacking. Try a "News" search for "George Zimmerman Prescription" and you will get 1700 news articles. Top headlines read; "George Zimmerman on Prescription Drug That Causes Aggression ...‎" "The Violent Side! The Prescribed Drugs Zimmerman Took Before He Shot Trayvon" and of course my favorite from Hip-Hop Wired (that bastian of solid, informed, unbiased reporting) "George Zimmerman High On Pills During Trayvon Martin Shooting"
See, yellow journalism is alive and well. You are in good company.